I received pictures of the Russian musketeers and grenadiers, both in waistcoats and in uniform coats, that Richard Ansell has just completed. The greens are at Griffin Moulds now so the process of turning the greens into production castings is well underway. These are "line" musketeers and grenadiers, which is to say that they are not Observation Corps figures. So all figures are in gaitors. We offer the choice of Russians wearing the Summer kit of a sleeved waistcoat as well as the traditional green uniform coat. NOTE: it is likely that the Russian officers, ensigns and drummers wore their uniform green coats at all time, so we did not make officers, ensigns and drummers in waistcoats (except for having a musketeer drummer in waistcoat). So this means that once these new figures are cast that Minden Miniatures will provide a rather extensive range of Russian infantry figures, both in Summer kit and in regular uniform kit, that covers the line musketeers and grenadiers and the Observation Corps musketeers and grenadiers. In addition, we have Russian artillery crews both in loading and firing poses. 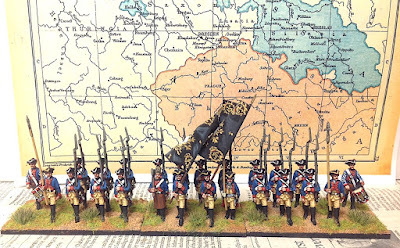 Russian cavalry remains on the to do list, however, the next batch of figures that Richard is working on include French heavy cavalry in bearskin hats, French foot grenadiers in bearskins, Austrian horse grenadiers in bearskins (do you catch the "bearskin" theme here?). Finally, French personality figures will arrive with Marshal de Broglie and Lt. General Chevert. View as you walk into the game room. 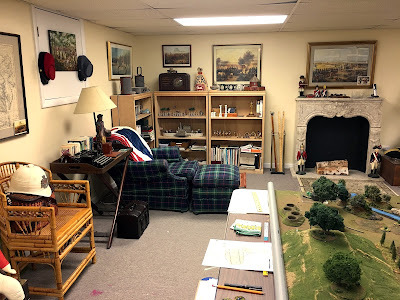 Earlier this year I reported on the massive changes that I made to my wargaming room, which entailed repainting the walls and trim, reducing the size of my game table and enhancing my reading area. Over the past couple of weeks I have added a number of artifacts and display items throughout the room and it is starting to take on a museum quality to it. Now I have the space to display my re-enacting unforms and a few other military trinkets, scattered around the room. I think that Edward Woodward ("Callan") would feel right at home in my game room. I'm always on the lookout for more military artifacts to display in the wargame room, perhaps changing out reproductions with the real thing (mostly in the ACW era). Edward Woodward (Callan) wargamed in style. 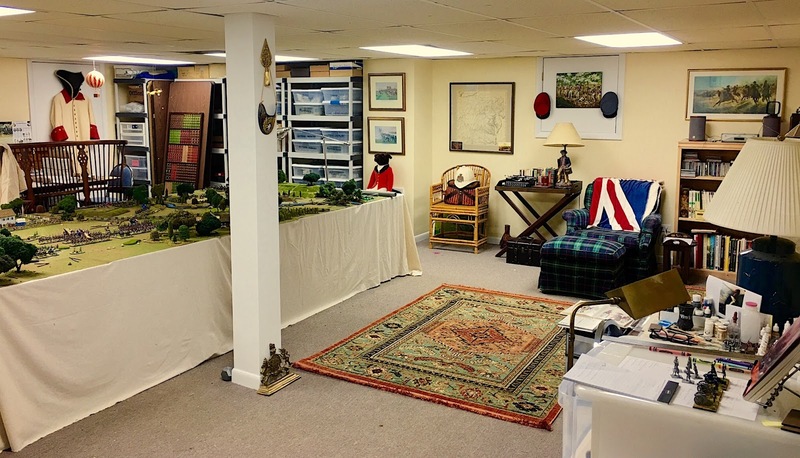 So let me take you on a virtual tour of my wargame room. As you walk into the room and look to your left (South Wall), you can see some of the storage drawers for my terrain and building pieces. Hanging from the ceiling are the hot air balloons of the Hesse Seewaldt Air Force. A uniform of the French regiment Bearn from the SYW can be seen hanging on the back wall. To the right of the Bearn uniform are more shelves, which hold most of my Minden Miniatures armies. After you have entered the room, if you look behind you towards the East Wall and the entry way, you will see a Confederate officer's uniform from my reenacting days. 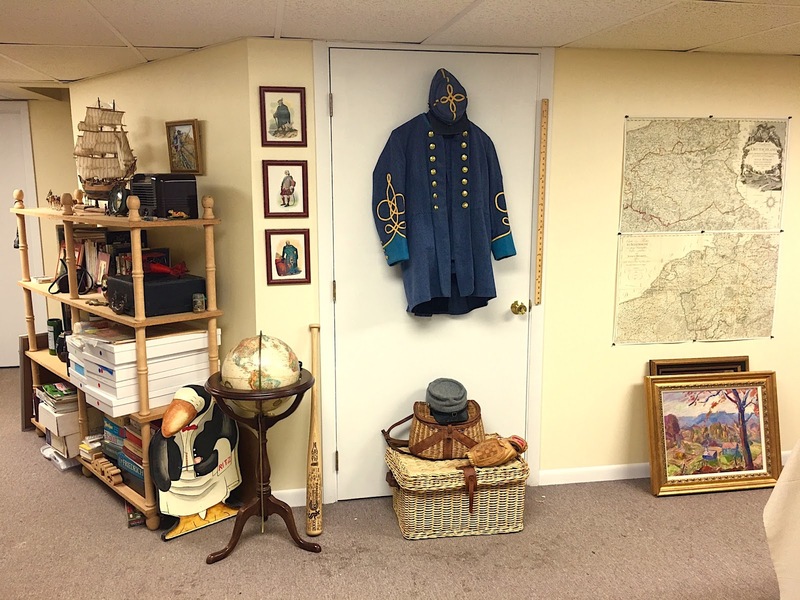 Both the French and the Confederate uniforms had been stored away for over ten years, so I thought that it would be nice to put them on display in the newly refurbished wargame room. The wood shelves on the left hold some books and trinkets that I've collected over the years, including a bakelite 1945 RCA radio. I also found an old 1930s Detroit radio that is displayed on the shelves in the reading area. The wicker fishing creel seen below belonged to my late father, who was an avid fly fisherman (for trout and salmon). I never developed much of an interest in fishing though. One of my favorite items in the room is a two-piece copy of a map of Prussia circa the Seven Years War that Bill Protz kindly printed off for me. The map conveniently includes roads so this makes for a perfect campaign map, should I do one for the SYW. A view of the game table, looking east. Close up view of the French Bearn Regiment uniform of the SYW. You can also see elements of the Hesse Seewald airforce hanging from the ceiling. Strong coffee, and plenty, awakens me. It gives me a warmth, an unusual force. A pain that is not without pleasure. 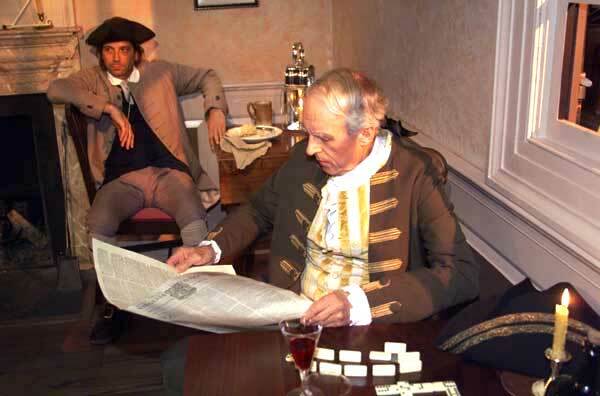 I have placed two cafeteria style tables (2.5ft by 6ft) together as a place to put my campaign map of South Carolina circa 1779. At the end is the area where I base my figures after they are painted. The television set is meant to show only DVDs, but I have not hooked it up yet. More tables, folded and leaning against the wall, can be seen. 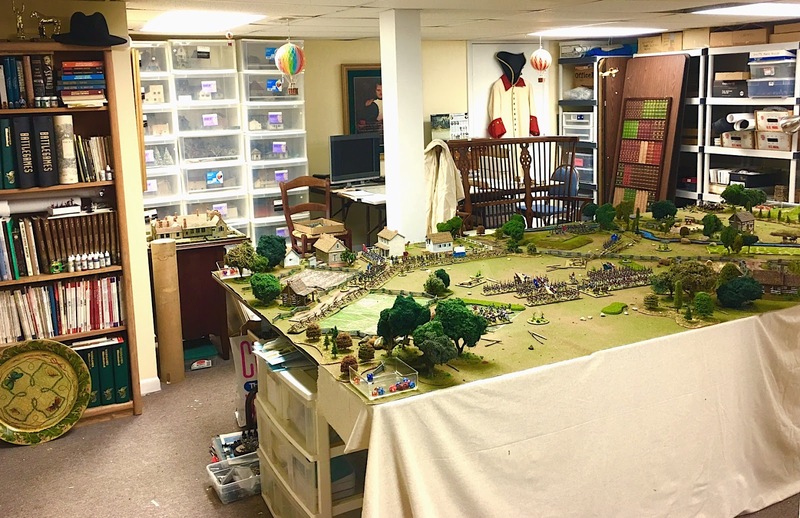 I have 5 or 6 spare tables that I no longer use, having shortened my game table from 15ft to 12ft in length and by getting rid of the 2.5ft by 15ft. of tables that ran parallel to my main table. Let us now turn our attention to the North wall. 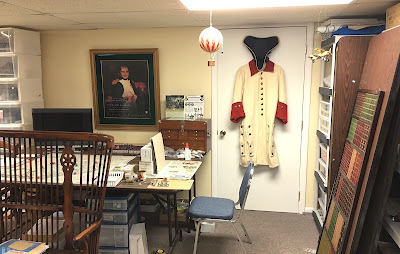 After you have walked over to the South Wall to examine the French uniform more closely, you turn around and take in the view of the North Wall of the room. This is where my reading area is located. Along the walls are some reproduction ACW forage caps and helmet for the British 24th Warwickshire Regiment. We all know the fate of the Warwickshire lads at Isandlwana and Rorke's Drift. How could I pass up buying this helmet? A view of the reading area and fireplace (fake) along the north wall. The fireplace mantel is a piece of furniture that I purchased some 30-40 years ago and I have hauled it around with me for the various house moves that I have made over the years. It could be used as an actual fireplace surround, but there is no fireplace behind it. It does, however, make for a good focal point in the room. To the left of the fireplace you can just barely make out a 19th Century antique umbrella stand that now holds yard sticks that I use in my wargames. The book shelves largely hold various sets of wargame rules that I have collected over the years as well as a small part of my 54mm toy soldier collection. The majority of the toy soldiers are stored away for now because they take up too much space. I keep a lot of my 18th Century uniform books on the shelf that is closest to the comfy chair and ottoman. I imagine that I will spend a lot of time there, listening to music and drawing up plans for the next batch of new figures in the Minden and Fife & Drum miniatures ranges. Yesterday I completed the painting of the 2nd South Carolina regiment using the new Fife & Drum South Carolina figures. I decided that it was time to put paint to the figures and create the regiment. The Second South Carolina in line. Next in the painting queue will be the 1st South Carolina regiment which would give me a nice little brigade of South Carolina troops. Both regiments had the misfortune to have been captured at Charleston when General Lincoln surrendered to the British. Nevertheless, as long as I am going to be running South Carolina campaigns, I might as well have some SC regiments in my collection. A little further down the road I would like to recreate the siege of Savannah or Stono Ferry. Keep a watch on this blog for some exciting news about some new things going on with Minden Miniatures. I heard the very sad news yesterday that Dean West had passed away. Dean was one of the nicest person that I ever met and ranks in my top ten list of students of history. I would always learn something new about history every time I talked to him. Dean was devoted to the Seven Years War Association and for quite awhile he organized the annual convention in South Bend and sought out game judges to run convention games. Dean was a master of herding cats as nearly every dealer and game judge had his own particular needs at the convention and somehow Dean came up trumps in attending to everyone's needs. Dean always had some the most beautiful looking terrain at the convention and he did it all without the fancy terrain boards, which seem to be the rage in this day and age. He did extensive research on the battle that he was going to host, right down to terrain elevations, etc. Dean used a simple outdoor carpet for each unique battle (i.e each battle had its own bespoke terrain mat) and permanently marked the streams and roads on the map. However, it was the terrascaping that really brought his game table to light. Dean downsized the building by one size, so if he was using 15mm figures, the buildings would be those made for 10mm figure. His forests were probably the best that I've ever seen. Dean told me that the key to a realistic forested area was to use different sizes and brands of trees with a few non-green colors added in here and there. This created a realistic diversity of trees that really made the scene POP. It sounds obvious, but too many of us go another way with our terrain. 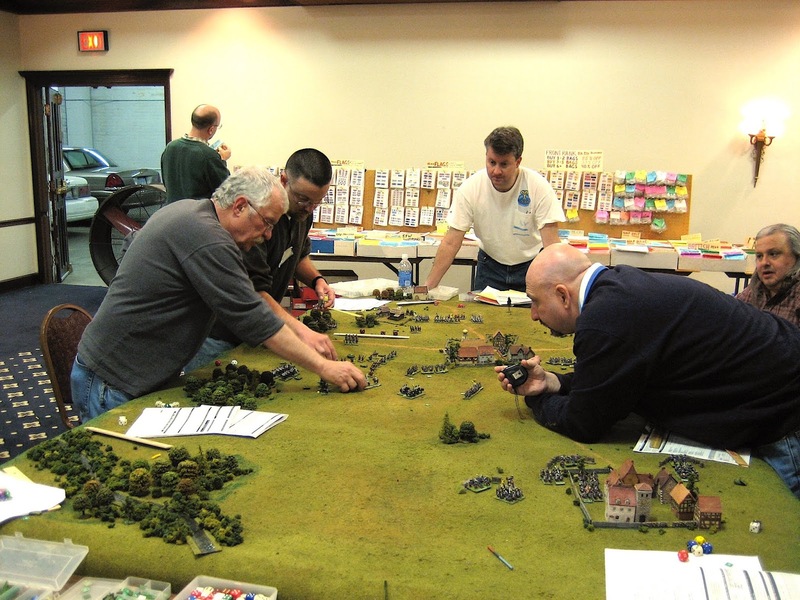 Below is a picture of Dean West's game at the 2009 SYWA convention. 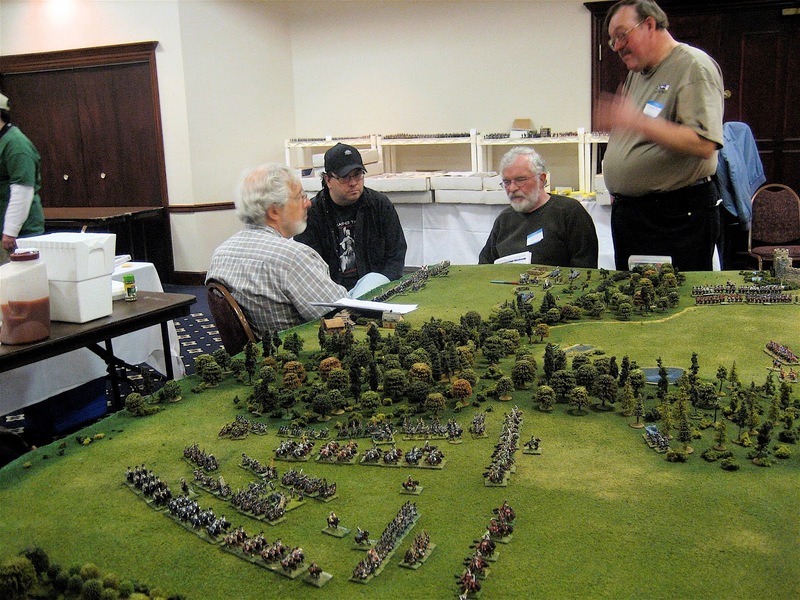 Dean West (center, with beard) at the 2009 Seven Years War Association convention. Dean was well versed in the American Civil War, in addition to his knowledge of 18th Century warfare. In recent years Dean was a member of an ACW cavalry reenactment group that portrayed both Union and Confederate regiments at events. Dean introduced the concept of actually using cavalry tactics in the reenactment events. You would think that the reenactors would already know cavalry tactics, but they didn't so Dean taught them and made them better performers. 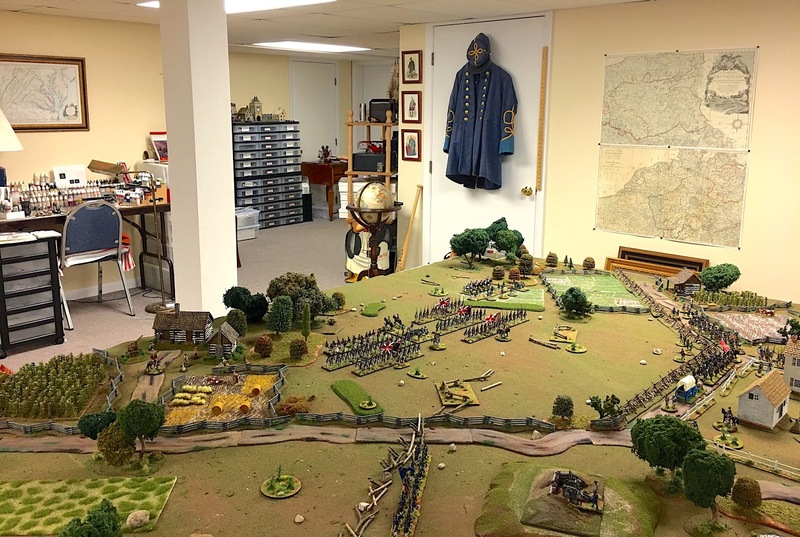 Dean also developed the Johnny Reb set of wargame rules along with John Hill. The rules were very popular with the gaming public. He also created a set of SYW rules called "the Final Argument of Kings" and he would stage historical battles every year at the SYWA convention. Dean West (left) at the 2010 SYWA convention. I can't recall the exact year, but it was the first year that Dr. Christopher Duffy visited the United States to attend a wargame show, this one being at GenCon in Milwaukee, Wisconsin. Naturally we were all thrilled at the prospect of meeting Duffy and asking him questions about 18th Century military history. We had arranged for a banquet dinner in Duffy's honor at a nearby restaurant and he gave a speech after dinner. During the speech there was a fellow at the back of the room heckling Dr. Duffy. He was obviously in his cups and he was ruining the evening for everyone at the banquet. At one point, the heckler shouted, "what about Bosnia?" "If you don't shut the f*** up I'm going to grab you by the nostrils and drag you out into the street." Dean might have been short in stature, but he was clearly someone that you wouldn't want to mess with regardless of your own size. When he was really mad (and that didn't happen very often), you could almost see the hair on the back of his neck stand up and his face would get really red. You would know that you were in for some "hurtin' " if Dean ever got to Defcon 4. The heckler left immediately and vanished into the night. The audience gave Dean a standing ovation. I'm sure that Dean probably felt a little embarrased by all the attention; he was that kind of guy. It goes without saying that we will all miss Dean very much. I think about the vast storehouse of knowledge in Dean that has gone away forever. He could spin a story about some of the most obscure people in history. Above all though, Dean was a leader and a true gentleman and he will be sorely missed by all of us. 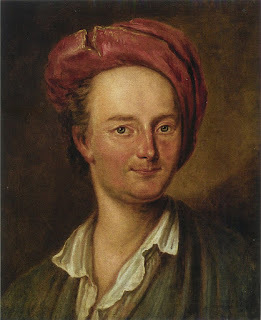 Ewald von Kleist was a major in the Hauss fusilier regiment (IR55), which was one of the few Saxon regiments , from the mass forced conscription of all Saxon regiments captured at Pirna in 1756, that remained in service. Christopher Duffy describes the regiment as a fusilier regiment wearing fusilier mitres. Kronoskaf illustrates the uniform with a tricorn hat rather than a fusilier mitre. He died from wounds received at the battle of Kunersdorf (actually some ten days after the battle) and Alfred Rambaud (The Russians and Prussians in the Seven Years War, translated by George Nafziger, 2013). Among the Prussian officers who fell at Kunersdorf, was one who was mourned in all of Europe's newspapers: it was Ewald von Kleist, major of the Hausen Regiment (IR55), the poet who wrote "Printemps", the author of so many other energetic and gracious pieces. Kleist, aged 44, found a glorious and cruel death. Frederick had drawn this regiment from the army of Prince Henry (serving in Saxony). With Finck's infantry he attacked the Russian positions. He already had a dozen contusions and two fingers of his right hand were cut. His saber in hand, he charged an Austrian battalion and received a ball in his left hand. Taking his saber from his mutilated right hand, he continued to fight. A canister shot broke his right arm and knocked him from his horse. Two of his soldiers carried him to the ambulance, where a surgeon began the necessary amputations. The surgeon was killed by a ball. Some Cossacks came up, robbed him, took his hat, his wig, his shirt. They would have killed him had he not spoken to them in Polish. Taking him for a Pole, they contented themselves with throwing him naked into the swamp. During the night he was saved by some Russian hussars, who dried him off, gave him an old coat and a hat; they warmed him at a camp fire, giving him some bread and water. One of them offered Kleist an 8 Groschen piece, and he refused it. The Cossacks returned, taking from him everything the hussars had given him. The next morning a Russian officer named Stackelberg, a cavalry captain, found him and had him taken to Frankfurt. Professor Nicolai received him at his house and cared for him. A number of Russian officers came to visit Kleist and offer their services. However, the care arrived too late and on August 24, 12 days after the battle, Kleist died of his wounds. The Russian commander of Frankfurt, Chettnov, rendered him military honors. The body was carried by a dozen grenadiers and the funeral procession was followed by the principal officers of the garrison. It is obvious that Ewald von Kleist was well-known throughout Europe for his poetry and other literary works, noting the extraordinary care and attention that he received after the battle. I find the von Kleist story very interesting and having some background on the person makes his regiment more interesting to me. As a consequence, I plan on painting the regiment and adding it to my Prussian Pomeranian Corps army. I note that the uniform has the Swedish cuffs rather than the smaller Prussian style cuffs, so this should add some variety to the uniforms in my army. (one stand of 8 figures has been removed from the picture in order to get a close up view of the battalion). 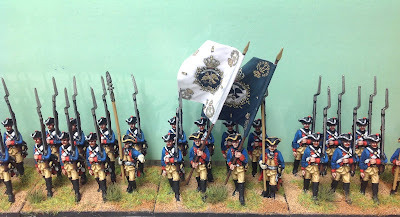 Today the second battalion of IR2 von Kanitz musketeer regiment went into service in my Pomeranian Corps of Prussian troops. 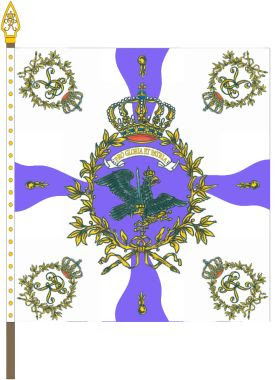 The flags were painted by hand using the Kronoskaf flag for the regiment as a template. IR2 von Kanitz musketeer regiment. Prussian regiments had two battalions. 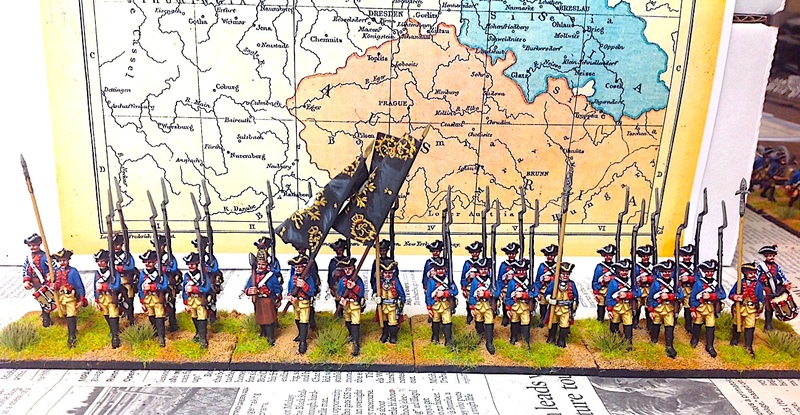 I use 32-figure battalions in my new organization for the Pomeranian Corps and I paint both battalions of a regiment. This gives me a complete regiment of 64 figures. Just for grins, I borrowed an extra 8-figure stand from the first battalion and placed it in the second battalion in order to see what a 40-figure battalion might look like. The reason for this would be to give the unit an better appearance of "balance" with a flag stand in the center and two stands on each side of it. This is what the battalion would look like with 40 figures. Here is a picture of my standard 32-figure battalion on four stands. It is sort of out of balance since the command stand is a little off center. However, my current solution is to attach a battalion gun stand to the left side of the battalion to give it that 5 stand balance. Which battalion organization looks better to you? Please feel free to leave a comment at the bottom of this page. I would like to hear your opinions. Royal typewriter, circa the 1930s. Yesterday I received the 1930s era Royal typewriter that I purchased off of eBay several days ago. I eagerly unwrapped it, put a sheet of paper in the platen, and ripped off a few "the quick red fox..." lines to give it a test drive. It took me less time than it took to type the two sentences above to recall that sometimes the Good Old Days are not as good as we remember them to be. Some of the keys require more fingertip pressure on them than other keys, so sometimes you will type some words and a few of the letters will look lighter or be completely missing when you are finished typing. We don't have such problems with modern word processors on our computers. The machine has been restored and doesn't appear to have any mechanical issues. It also looks really really cool! The front view of the typewriter, which displays nicely infront of a collection of 1930s detective novels. I simply like the retro look of the Royal typewriter as shown in the close up view of the keyboard below. Close up view of the keyboard. The key characters are enclosed in glass with nickel plated keys. The Royal 1930 typewriter will probably be used only as a decorative display piece in my wargame room, but you never know. 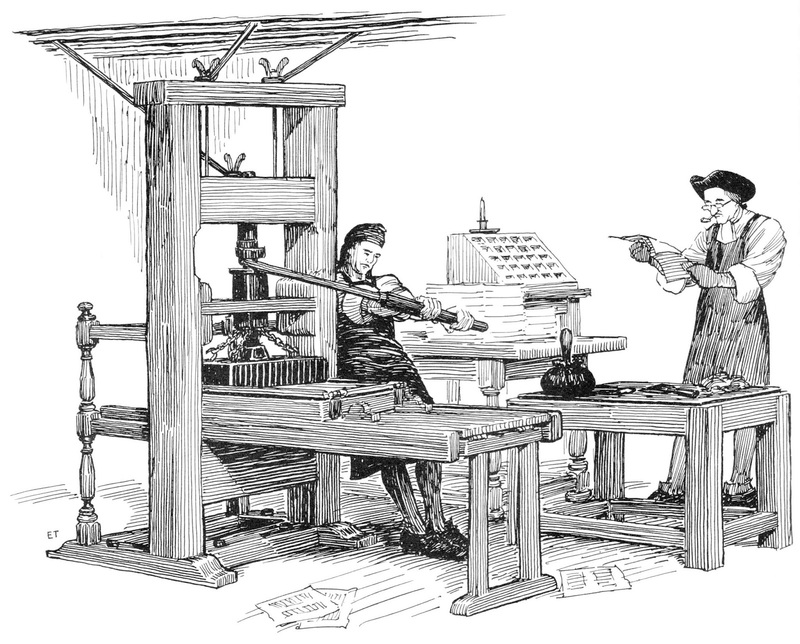 I might feel the urge, once in awhile, to break out some paper and click and clack off a few paragraphs. 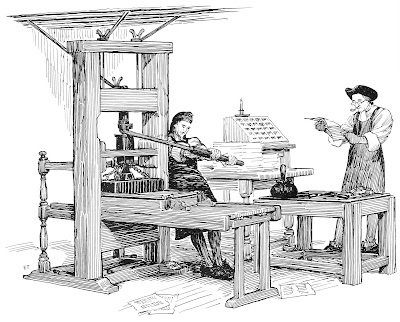 I suppose that I could go back further than Old School and get a colonial printing press, but that is an entirely different hobby than what I am doing with my writing these days. for tomorrow's edition of the Der Alte Fritz Journal. Readers eagerly look forward to reading the latest post on the Der Alte Fritz Journal. Frederick grabs the colours of the IR46 von Bulow regiment at Zorndorf. Here is a listing of all Prussian infantry and cavalry regiments that were from East Prussia. The "record" comments are taken from Christopher Duffy in "The Army of Frederick the Great". 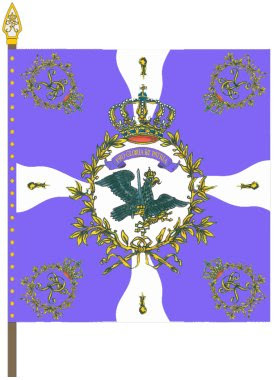 I am using this information in the construction and painting of my Pomeranian Corps of Prussian troops that largely fought in the eastern theater against the Russians. Record: Unusually hard fighting regiment (especially for an East Prussian regiment) with consistently high casualties. One battalion captured at Maxen. Record: Badly knocked about at Gross Jagersdorf and behaved badly at Zorndorf. One of its Chefs, Rautter, was disgraced for his performance at Zorndorf, while Thadden was known as a drunkard. Grenadier battalion: with IR16: Polentz, Kleist (1757), Willemy (1758), Thielau (1762). Severe losses at Zorndorf. Captured after fighting bravely at Maxen. Record: Large numbers of Austrian and Russian prisoners were incorporated in the Seven Years War. The regiment did notably badly at Zorndorf, and at Maxen, where it broke up before being captured with the rest. Grenadier battalion: with IR14: Gohr, Petersdorf (1757), Beyer (1759), Oppen (1760). A generally reliable battalion. Record: Suffered heavily at Gross Jagersdorf and Kunersdorf, and lost one battalion at Maxen. Record: Heavy losses at Zorndorf and Kunersdorf. 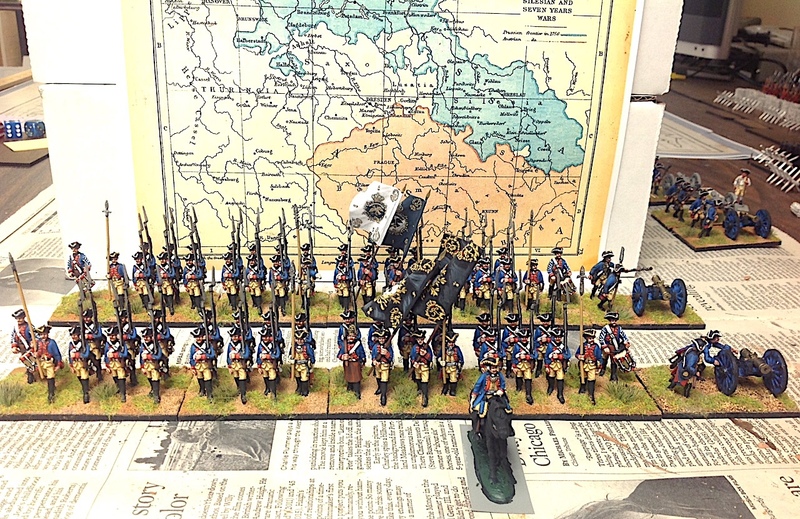 A middling East Prussian regiment, disliked intensely by Frederick. Record: heavy losses at Gross Jagersdorf. The component battalions captured at Landeshut (1760) and Colberg (1761). Grenadier battalion: with Garrison 1, formed an independent battalion Bahr. Record: raised in the 1740s and again in 1756. Disbanded in 1757. Record: the battalion was initially posted on the border. It was no match for the Russian regular and irregular troops in direct confrontation so it was used mainly in ambushes along the Russian communication lines and raids on baggage trains. 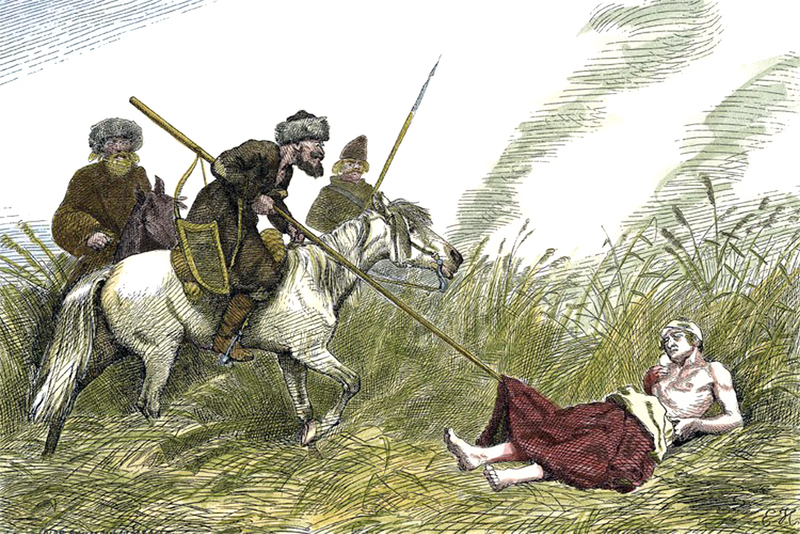 It also had to stop Cossack incursions. In one engagement, supporting 200 hussars, it managed to prevent a landing of 2,000 Russian troops at Schaaken in the Curonian Lagoon. 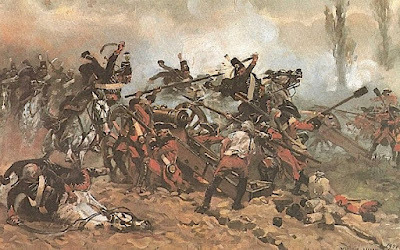 In January 1758 the battalion was disbanded to prevent its capture by the Russian army. Uniform: the Lithuanian companies it had a unique grey coat with no lapels or collar, but blue Prussian style cuffs. The coat resembles a sleeved waistcoat in the French or Russian style. Waistcoat and breeches were supplied by the indivual militia man. Gaitors were grey. Grey gaitors. Black tricorn without hat lace. The Prussian and Polish companies had a blue coat, similar to the description of the Lithuanian companies. Individual companies had different cuff colors. Record: distinguished at Gross Jagersdorf and Zorndorf. Record: lightly engaged until 1761, when destroyed in the campaign around Colberg. Record: at Gross Jagersdorf. In western Germany 1758-59 with Prinz Ferdinand's army, where it fought at Minden. Highly esteemed by Frederick. Station: various, but recruited from East Prussia. Record: renowned for the wealth of its officers and the ferocity of its hussars. Three squadrons distinguished in western Germany in Prinz Ferdinand' army. Station: varioius, but recruited from East Prussia. Record: Distinguished at Zorndorf, lost six squadrons at Landshut. After peace it took the number of the disbanded HR7. Frederick specifically exempted it from criticism. IR2 - von Kanitz musketeer regiment. 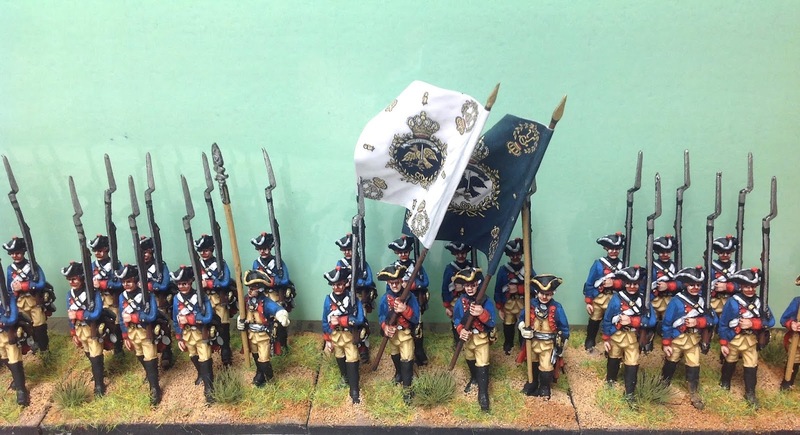 Minden Miniatures and GMB Designs flags. I have finished painting and basing the first battalion of the Prussian von Kanitz (IR2) musketeer regiment in Prussian service. The regiment will be part of my Pomeranian Corps army that will fight the Russians in tabletop battles. I am starting work on the second battalion today and should have it finished within a week's time. 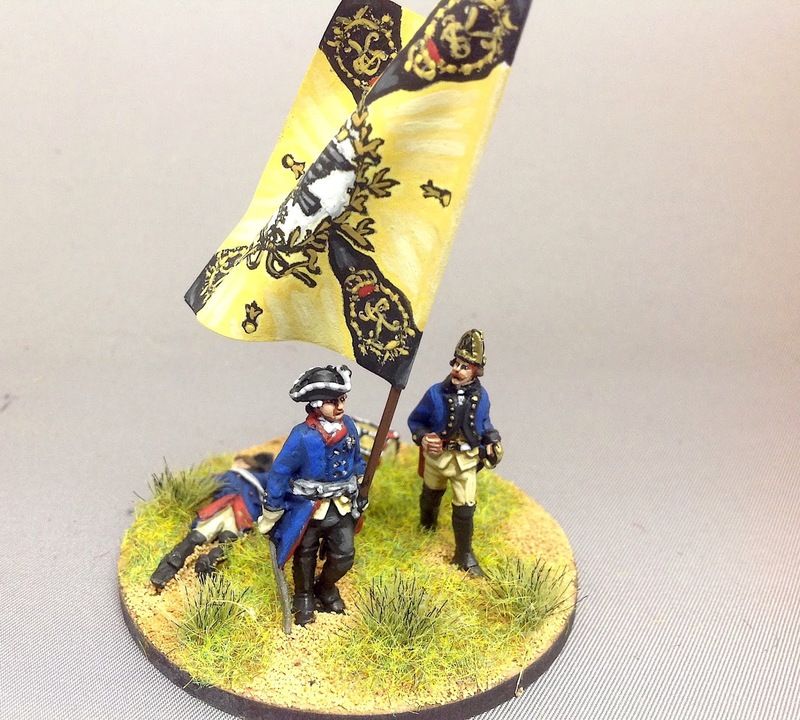 The figures are Minden Miniatures Prussian musketeers with Prussian cuffs. A close up photo of the command stand and some rank and file soldiers. 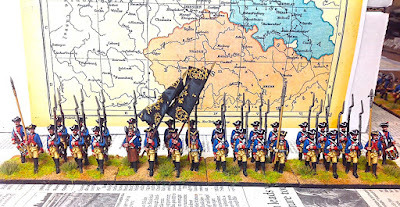 Frederick the Great had a very low opinion of the East Prussian regiments in his army, however, he considered the von Kanitz regiment as one of the better fighting units in his army. However, the regiment was rather unlucky, suffering high losses in a number of battles against the Russians. The regiment fought in Lehwald's army at Gross Jagersdorf and suffered heavy losses. It also fought at Zorndorf, Paltzig and finally at Kunersdorf. The Kunersdorf losses were so great that the regiment was reduced to a single battalion. Since the regiment's recruiting grounds in East Prussia were occupied by the Russian army, the von Kanitz regiment could not replenish its losses after Kunersdorf. The battalion was then captured by the Austrians at Meissen, where it was part of Diericke's small force that got stranded on the wrong side of the Elbe River. With nowhere to retreat, the whole command surrendered. The regiment was reraised in 1760 with unfortunates who were press-ganged into the Prussian army. Der Alte Fritz needs to cull some books (62 in all) from his personal library to save space and is offering nearly everything for a rock bottom price of $5.00 per book. There are a couple of items that are so good that I am pricing them at $10.00 per book. The total lot of 62 books prices out around $310.00 plus applicable postage so if anyone was interested in buying everything at once, then I'd offer the lot at $200.00 plus applicable shipping.